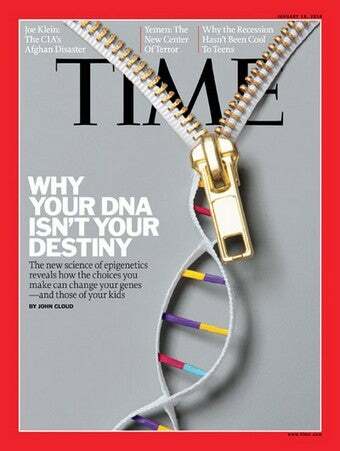 According to this week's Time cover story, the new thing in science is epigenetics, which is basically the study of how having a cigarette will destroy your unborn children, grandchildren, and great-grandchildren. Time's John Cloud kicks off the piece with a description of research in the awesomely named Swedish parish of Overkalix. Back in the nineteenth century, Overkalix had unpredictable harvests, and its residents endured some years of starvation only to enjoy others in which they totally stuffed their faces. But going from normal eating to gorging turned out to affect not just Overkalixians (Overkalices?) but their children and grandchildren — those whose ancestors pigged out during abundant years died earlier than average. The difference was apparently stark — researchers say that after they controlled for socioeconomic variables, grandsons of boys who had just one gluttonous winter lived 32 years shorter than those whose ancestors ate less. The sheer magnitude of the difference makes me a little skeptical, and it's hard to believe that the researchers were able to control for all variables that affected children living over a hundred years ago. Still, Cloud presents some other evidence that environmental influences can affect not only our genes but those of our offspring. Fruit flies exposed to a certain drug get weird eye growths that last for a staggering 13 generations, and roundworms that eat a certain bacteria can become "dumpy" — and give rise to 40 generations of dumpy young. According to one study, the sons of men who started smoking before age 11 had higher BMIs than sons of men who didn't — though Cloud's extrapolation that these boys will probably die earlier as a result seems questionable. [I]f the genome is the hardware, then the epigenome is the software. "I can load Windows, if I want, on my Mac," says Joseph Ecker, a Salk Institute biologist and leading epigenetic scientist. "You're going to have the same chip in there, the same genome, but different software. And the outcome is a different cell type." For decades, we have stumbled around massive Darwinian roadblocks. DNA, we thought, was an ironclad code that we and our children and their children had to live by. Now we can imagine a world in which we can tinker with DNA, bend it to our will. It will take geneticists and ethicists many years to work out all the implications, but be assured: the age of epigenetics has arrived. Epigenetic research has apparently yielded a treatment that moderately extends the lives of patients with certain rare blood diseases. But all the late-nineties hype over gene therapy has so far not lead to a medical revolution, and scientists haven't yet figured out a way to turn red wine into a magic longevity pill either. This is not to say that epigenetics doesn't hold promise, or that it isn't worth knowing how our lifestyles might affect future generations. Still, epigenetic research may not really illustrate "how bankrupt the phrase 'nature versus nurture' really is" (as science writer David Shenk claims) as much as it shows something that seems quite intuitive: that nature and nurture are intertwined. This might alter how we think about environment, health, and disease, and it might eventually lead to some new treatments. But for now, it won't really change how — or how long — we live our lives.